Yemen’s main port city should be declared a “neutral zone” and the United Nations could play a role in Sanaa airport, the Iran-aligned Houthis’ main negotiator said on Saturday on the sidelines of talks aimed at ending the Yemeni war. The Houthis control major population centers in Yemen, including the capital Sanaa and the Red Sea port of Hodeidah, a lifeline for millions of people that is now a focus of the war after the coalition launched a campaign to capture it this year. 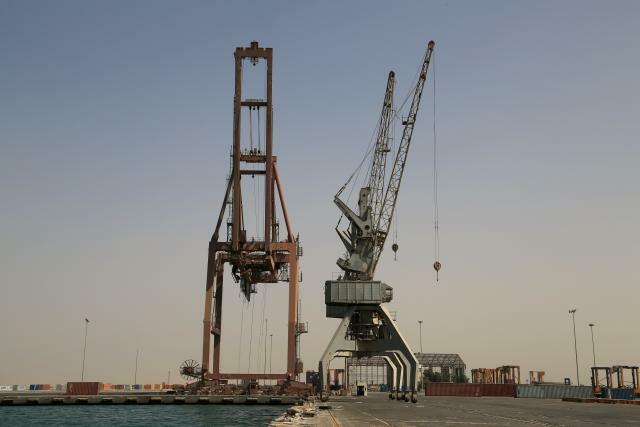 Special envoy Martin Griffiths is trying to avert a full-scale assault on Hodeidah, the entry point for most of Yemen’s commercial goods and vital aid. “It (Hodeidah) should be a neutral zone apart from the conflict, and the military brigades that came from outside Hodeidah province should leave,” Houthi negotiator, Mohammed Abdusalam, told Reuters in Rimbo on the sidelines of peace talks with the Saudi-backed government. The U.N.-sponsored talks, the first in more than two years, are focused on confidence-building steps, including reopening Sanaa airport and a truce in Hodeidah that could lead to a broader ceasefire in the nearly four-year-old conflict that has pushed Yemen to the verge of starvation. “We have proposed to the U.N. to oversee the port and supervise its logistics... inspections, revenues and all the technical issues,” he said, while declining to say who will control the city if both forces leave. Yemen’s government is sticking to its position that Hodeidah should be under its control. Griffiths secured a prisoner swap deal on the first day of the talks on Thursday. But a U.N. source said the two sides remained far apart on Sanaa airport and Hodeidah. The Houthi negotiator said dedicated committees are still discussing the number of prisoners involved. Abdusalam said his group was open to the possibility of a U.N. role at Sanaa airport to secure agreement to reopen the facility, which has been bombed several times. “The closing of Sanaa airport was a political decision not because of security concerns… if we agree on its reopening, we are ready to discuss those details,” he said. The airport is in Houthi territory but access is restricted by the Saudi-led coalition, which controls the air space. On Friday, the government proposed reopening the airport on condition planes are inspected in the airports of Aden or Sayun which are under its control, but the Houthis rejected this. Abduslam said any political solution to the war should start with outlining a transitional period with an exact timeframe, and should include all the country’s political parties. Many Yemenis factions are involved in the war that pits the Houthis against a Saudi-led coalition that intervened in Yemen in 2015 to restore the government of Abd-Rabbu Mansour Hadi. Abdusalam said a ceasefire would be the first condition for a political solution. The humanitarian suffering in the region’s poorest countries has added to pressure on the parties to end the conflict, with faith in the Saudi-led war effort flagging among Western allies. The war and economic collapse has left 15.9 million people, 53 percent of the population, facing “severe acute food insecurity” and famine was a danger if immediate action was not taken, a survey said on Saturday.